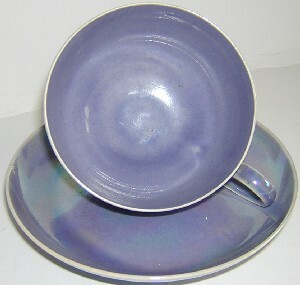 ITEM R118 - Ruskin Lustre cup and saucer. Ruskin England 1922 backstamp. 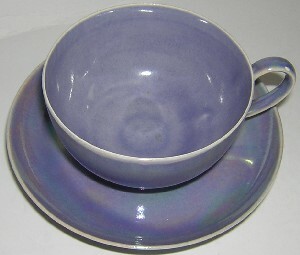 A superb and extremely fine Ruskin cup and saucer decorated in a lilac lustre glaze. The saucer is approximately 5" in diameter, and the cup is approximately 3½" in diameter and 2" tall. 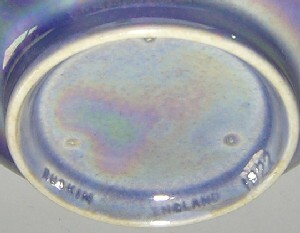 The cup is impressed with the Ruskin England 1922 pottery mark, and the saucer stamped with the Ruskin England pottery mark. Condition: Excellent overall condition with some crazing. This extremely fine Ruskin cup and saucer really is an unsual and very delicate piece of Ruskin!